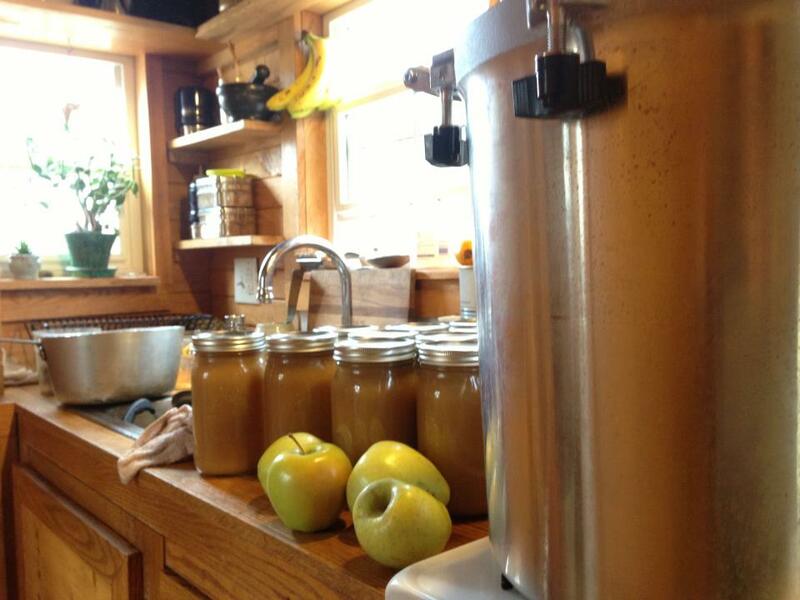 On Sunday, I posted a picture on Facebook of the apple canning I did this weekend. One reader thanked me for posting, because she was just telling someone, “A small home doesn’t mean you cannot can food or live a ‘normal’ life.” I like how she put normal in quotations. It’s true. Life in the tiny house is life, and from my perspective it feels pretty normal. Even though there are moments of frustration when I have to adjust my activities to this tiny space, exercising my creativity to find a solution brings unexpected rewards. Turning a bushel of local apples into twelve quarts of jarred applesauce last weekend challenged me. In summer, we do all of the canning outside on a turkey fryer burner. Since the propane tank was empty, and it was cold, I decided to make the applesauce inside. A bushel of chopped apples fills a 40 qt. stock pot. That’s a lot of apples, a lot of chopping, and a lot of pot on a small stove. I hand chopped the apples, since they were late-season apples with some bad spots. Luckily, I bought a food mill this season, so I didn’t have to peel or core the apples. After finishing the chopping, I added enough water to cover the base of the pot and turned on the burner. The main challenge at this stage was stirring, but the reward was an unexpected bicep workout. Keeping the lid on between stirring helped the apples to break down faster. Once they started to soften, I stirred them more often. This took about 40 minutes. Smaller batches go faster. I started the apples late in the day, so when I finished saucing them, it was too late to start canning. Our refrigerator is an under-the-counter bottle cooler, so there is no room for a giant stock pot. I knew I had to get the apples cooled down to 41 degrees, hold them above 140, or risk spoilage. When Karl got home, I had just settled on putting them in the oven which meant I had to take the sheet pans, skillets and rack out of the oven and place them in the shower. Chef Karl to the rescue! Food safety is his game. Lucky us. “Holding hot food for longer than six hours is dangerous,” he told me as he got online to check the weather. “It’s going to be 38 tonight. Let’s put it outside.” He went up to the shed and came back with our giant stock pot. This stock pot is so big the kids play in it by getting inside and rolling back and forth. “Do we have a lid for that pot?” I asked him. “We do now.” He said. I went outside to find the round toboggan upside-down on the giant pot with the smaller pot on top to weigh it down. Problem solved. With more surface area exposed in the giant pot, the sauce cooled nicely overnight. In the morning, I ran the sauce through my new food mill. What a time-saver! It separates the sauce from the skins, stems and seeds. I fed those to the chickens and put the sauce back on the stove to heat. Meanwhile, I walked up the hill to get the jars and lids. Walking outside in the cold air, I heard the rooster from a neighboring farm, and watched the sun peer over the ridge. Having to retrieve the jars from the shed forced me out into nature, and it was a sweet moment, indeed. Back in the house, I set a small pot of water on the stove to boil. While the sauce was heating, I sterilized the quart-sized jars one at a time and lined them up, awaiting the sauce. We invested in another new tool this summer—a pressure canner*. The pressure raises the temperature higher than the boiling point which shortens the processing time and allows canning of non-acidic foods. Until now, we used water-bath canning. Karl walked me through the steps, and we finally canned that sauce. It is delicious, even if it took me all weekend. So, we do normal things like can food in the tiny house. Is it always simple and convenient? No. However, there are rewards: we are fully involved in what we do, and we get to exercise our resourcefulness and creativity, and we get outside. Besides that, it’s fun doing something that is a little bit hard. *Be sure to read all directions before using a pressure canner. Pressure and high temperatures call for utmost diligence. If you haven’t canned before this is a good place to start. LOVE IT! I actually made a small batch of apple butter this summer and small batch strawberry preserves for the first time ever! Just to teach myself how its done! I think canning is something we need to know! Especially in the coming years you just never know what kinds of recources this economy will force us to go back to! My husband and I are thinking and planning more and more on ways to make a more self sustainable life! Your tiny house and wonderful little family has inspired me since I first learned about you guys! Keep posting!! It feels good to be more self-sufficient, doesn’t it? I bet your jam and butter were delicious. Thanks for reading and leaving a comment! Be well. How do you like them apples??? I like it! Isn’t it true how a sense of normalcy is so different from person to person. Years ago when my daughter started public school, I was introduced to a new batch of parents to get to know. One mom had asked about my daughter’s favorite snack, dried apples. So I told her how simple it was to dehydrate them. Another mom laughed out loud exclaiming, “yeah, right, and I bet you grew the apples, too.” Living in a big city, I realize there are so many people who haven’t even experienced an orchard. “Yes, if you plant cucumbers and carrots.” And just like that, he fell asleep. I just found your blog and love it. Thanks for sharing your corner of the world. It looks beautiful. “Normalcy” is so subjective. 🙂 I’m often asked this about our military life, living with a my health conditions, along with how we manage when we’re at the homestead, making due with water storage and a camp toilet. Thanks for sharing your canning experience with the entire process! It apples look so great! I’m not sure if I’ve read this before.. but how do you organize your food storage? Do you have auxillary storage outside (or a deep freezer?) Will have to check back through your photos and see if you had posted one before, that I missed. We’re only part time but are expanding to a slim pantry so we can have better vertical space.. and then we also have smaller items tucked into baskets on the wall bookshelf. We also still have to defrost the apartment sized freezer this month.. have to say that I’ve been dreading that! Thank you for sharing, one of my biggest concerns regarding downsizing to a tiny home was still being able to be self sufficient on our land. That means still being able to can and dry lots of food. Hi, Jessica, Thank you for reading! Anything is possible if you are willing to adjust. It’s a fun exercise in creativity. Good luck!! I just LOVE your blog! Just found it – as it was linked through tinyhomeliving. Keep up the good work… and more photos please!